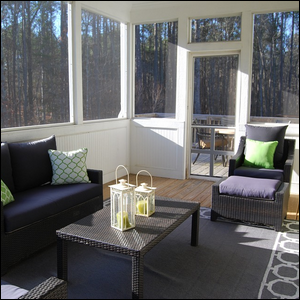 Throughout The Northeastern U.S., Sunrooms Are Commonly Referred To As? The Square Where Julius Caesar Was Assassinated Is Now A? If you’re a west coast transplant now living in the northeast and northeastern midwest, you may be a bit confused to hear people talking about the “Florida rooms” in their homes. What people in the region call a “Florida room” is what people in other regions might call a sunroom, solarium, or, in some cases, a three-seasons room. Florida rooms are rooms within or adjoining a home that are designed to allow a lot of sunlight and fresh air into the home, and may be weatherized to the point that they can be used all year long or left unheated and only used in the warmer months. Why “Florida room” instead of the more widely used “sunroom”? There is a long history of people in the northeastern U.S. vacationing in sunny Florida to escape the chill of the winter (and, in fact, some of those “snow birds” establish a permanent residence in their old age to permanently avoid the cold). It was only natural that when the northerners returned north and tried to recapture some of that near-equatorial sun and brightness, they would refer to the room in which they did so as a Florida room. Curiously, Florida rooms aren’t the only spaces in homes to bear the name of a state. In Arizona and the surrounding arid regions, you’ll find “Arizona rooms”, which are screened in and covered porches designed to let air flow freely while avoiding the searing desert sun and insects. Frankly, we’d like to see the etymological trend continue with each state getting its own type of room. Perhaps “Colorado rooms” could be a variation of the sunroom with large A-frame windows designed to help you take in views of the Rocky Mountains, and “Alaska Rooms” could be super-insulated with glass roofs to help you cozily enjoy the Northern lights.